After loving 'Fangirl' by Rainbow Rowell, I decided to pick up Eleanor and Park which has been sitting on my bookshelf for a while now just waiting to be read. Eleanor and Park did not disappoint! My favourite additional characters were Eleanor's friends, DeNice and Beebi and Park's mom Mindy. I found DeNice and Mindy's conversations with Eleanor after gym class left me laughing out loud sometimes while reading.I also thought Park's mom Mindy to be so funny, I don't think her character was supposed to be funny but I just found how brutally honest and to the point she is to be hilarious at times. 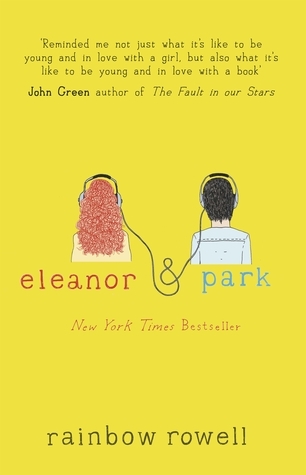 The relationship between Eleanor and Park in this book was the kind of relationship in a book where I could literally read a never ending book about it and never get bored, it just seemed so real and true, it wasn't always perfect and there was bumps in the road, but you could still see they were meant for each other. For anyone who has already read this book you are going to know what I am talking about, if not you might as well skip this part. The ending of this book left me so annoyed, I hate cliffhangers! What were the 3 words Eleanor sent to Park, I know the obvious answer would probably be "I love you" but I am the kind of person that needs a defiant answer to these kind of things After reading the authors note at the end of the book, where the author talks a bit about the last three words, I changed my mind a little bit as I like the way she explains that she felt it was a private moment between the two of them, and that it felt rude intruding on that special moment, that it should be kept to themselves, it didn't feel right to share what Eleanor wrote...It still kind of pissed me off though.. Although this story didn't necessarily have the happy ending I was expecting, I feel it suited the book the more I thought about it and the more I read the authors note in the back.They are only 17 years old! it may be the end of the book, but they have may more days ahead of them. Like Rainbow Rowell said "I don't believe that 17-year-olds get happy ending. They get beginnings". 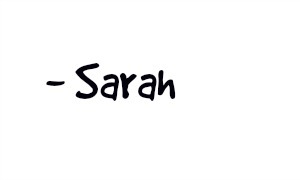 Nice review, Sarah :) I'm actually reading "Fangirl" right now and think I will probably pick up "Eleanor and Park" soon, too! :) My blog is also new and maybe you'd like to check it out? I liked your review, though!